Made from simple, clean, nutritious ingredients, Crunchsters is on a mission to elevate the way you snack! 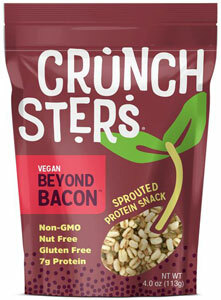 Made from the mighty Mung bean, Crunchsters are crispy, crunchy, and above all, good for you! Crunchsters are low in saturated fat, are full of healthy fiber, are low in sugar, and contain 7 grams of tast plant-based protein in every serving, making them a great everyday snack as well as a high-performance refueling treat for those who are active and on-the-go all day long. They're full of healthy minerals, are non-GMO, they're nut-free as well as gluten-free, and come in a range of addicting flavors that are a challenge to stop eating once you've tried them! If you like the smoky flavor of bacon, then you'll flip over these delicious vegan snacks that have awesome smoky and slightly sweet bacon-y flavor while being kind to our curly-tailed friends! 4 oz. (113g) packages are $4.99 each.